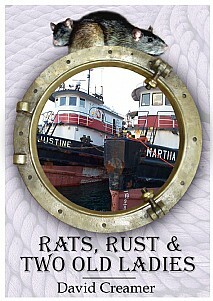 A rare and true-life seafaring adventure with a difference! Delivering two 38-year-old Mississippi river tugboats halfway around the world from Bahrain to Trinidad would not be every ship master's dream employment. However, for Captain David Creamer, the seven-week voyage of the Justine and Martha was not only unique, but a memorable experience he was unlikely ever to forget or repeat. As the author relates the day-to-day problems that the twelve crewmen encountered while living onboard, the reader is drawn into their world. The discovery of a plague of rats, steering problems, running out of fresh water and running aground in the middle of Sitra port, Bahrain are just some of the difficulties the two old boats encountered on their way to the Caribbean. Rusty water, fuel oil in a toilet, and a fire onboard in the Gulf of Suez were some of the setbacks experienced on the first leg of the voyage. Designed principally for river work and not as ocean-going or deep-sea vessels, the hapless Justine and Martha encountered a short but violent Mediteranean storm on the passage from Port Said to Malta rendering conditions onboard extremely uncomfortable. On the leg of the journey from Malta to Trinidad, they hit more bad weather, partially flooding the Martha. It also became apparent that the fuel taken onboard by both vessels was biologically contaminated. Forced to stop at Gibraltar to clean the fuel tanks, the author and Chief Engineer visited Nerja in Spain, which coincided with the start of the Mardi Gras. This humorous and unforgettable adventure story will be of enormous appeal to anyone interested in real-life stories, maritime tales, all armchair sailors and anyone looking for an engrossing read.